Ghostwatch: Behind the Curtains: "...Only fools are positive." 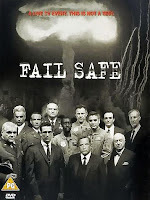 In a similar vein to Ghostwatch, Fail Safe is a remake of a classic 1964 TV movie of the same name that discussed the threat of nuclear annihilation. Broadcast on CBS in 2000, the film features an impressive cast list - including George Clooney, Richard Dreyfuss, Harvey Keitel, Don Cheadle, James Cromwell, Hank Azaria, Brian Dennehy and Noah Wyle to name but a few. The story takes place in decades past. Clooney is a fighter bomber pilot sent on a routine patrol who, due to a technical mishap, is mistakenly ordered to bomb Moscow instead of return to base. What follows is a tense and moving power struggle as both the US and Russian military leaders reluctantly join forces in a desperate attempt to call back the planes, having already crossed their point of no return... or failing that, shoot them down. With a powerful, anti-nuclear message, Fail Safe is definitely worth checking out. The script and acting are both superb, and it is even more impressive that the film went out live on US TV back in 2000. Its simplicity, or perhaps efficiency, is key to its success. Depicted in black and white, the film almost plays more like a stage drama than a TV movie. The dialogue is tight and gets the message across without ever becoming stale. In short, if you can, check it out. And be sure to stay tuned for more Ghostwatch-like reviews coming soon!